Every musical genre has its own iconography in which certain singers, musicians and bands ascend to a revered status and the same applies to particular recordings. In the now huge panoply of Irish traditional releases, some albums have withstood the test of time and still serve as essential reference points for contemporary musicians. Examples generally held to fall into this category include the debuts by Planxty (‘The Black Album’) and The Bothy Band (1975), Molloy/Brady/Peoples, Leo Rowsome’s Rí na bPiobairí (‘The King of the Pipers’) and Johnny Doran’s The Bunch of Keys. Another which is often so cited was the oddly-titled All-Ireland Champions - Violin which originally appeared in Ireland in 1959 on the Shamrock label, ‘oddly-titled’ since only Paddy Canny was an All-Ireland Senior title winner in his own right, though P.J. Hayes had led the Tulla Céilí Band to success in 1957 (and would repeat the victory in 1960). Unlike the other albums cited above which have all been relatively easy to obtain since their release (and all remastered on CD), the quasi-mythological status of All-Ireland Champions - Violin has been enhanced simply because it has been impossible to obtain since the mid-1970s, although home-produced cassette copies have circulated. One alleged reason for its previous unavailability is that the copyright holder refused to grant permission to interested labels. So, its eventual reissue in remastered CD format by Shanachie offers the opportunity to reassess this album and determine whether, more than forty years on, it still has the power to enthuse, inform and delight. Firstly, there are four significant changes to note. The most immediate of these is the alteration to the title to An Historic Recording of Irish Traditional Music from County Clare and East Galway. 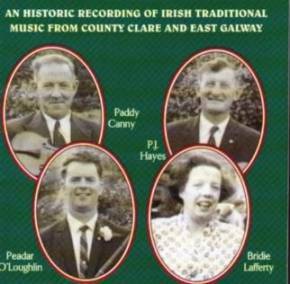 Though more accurate than the original, the presence of ‘East Galway’ has raised some eyebrows since this recording has always been assumed to a be pure drop of predominantly East Clare music thanks to the presence of Canny and Hayes. However, as P.J.’s son, Martin, reminds us in his introduction to the liner notes, “Even the geographic definition of a regional style is often blurred, as is the case with east Clare and southeast Galway where the styles are very similar.” Indeed, P.J.’s birthplace of Maghera is but a short distance from the county border with Galway. So, while technically this is a recording of two musicians from East Clare, one from West Clare (Peadar O’Loughlin) and one from Dublin (Bridie Lafferty), it would be pernickety to argue that this does not represent a recording of a sample of the local repertoire. The second change lies in the reorganisation of the album’s running order. The author of the bulk of the liner notes, Don Meade, simply states that “This Shanachie reissue was digitally remastered with some alteration of the original sequencing” without explaining why this was done. The only plausible reason is that the producer, Daniel Michael Collins, felt that the original running order lacked variety since side A of the original vinyl LP featured all four musicians while side B consisted entirely of fiddle duets by Canny and Hayes. Additionally, the original made no attempt to vary the content by interspersing tune types, so all the reels and jigs were bundled together on each side. Now it is very easy for listeners to get precious about the running order of their favourite albums since habituation breeds expectation. However, it always struck me as perverse that All Ireland Champions - Violin adopted this hugely artificial running order in the first place and no reflection of the manner in which the musicians were accustomed to play. Since the album was clearly recorded on the cheap in just a few hours and vinyl albums were still a relative novelty in Ireland it is quite possible that little thought was given to the record’s organisation. Whatever the case, there’s little doubt that the musicians were not involved in the choice of the album’s final tracks or order since Peadar O’Loughlin has recalled that he and Paddy Canny recorded a number of fiddle-and-flute duets, only one of which (Kitty Gone a-Milking/Music in the Glen) actually appeared on the album. According to the liner notes, “Peadar O’Loughlin believes that the remaining tracks were intended for another recording” which, of course, never appeared nor does anyone admit to knowing the whereabouts of the master tapes. The third piece of tinkering is a little more subtle, though immediately apparent, if the listener is aware, in that very first track of the original version, Kitty Gone a-Milking. As was then fashionable, Bridie Lafferty used to lead off each set of tunes with a pair of repeated chords (the characteristic thump-thump establishing the tune’s rhythm). How this practice emerged is open to question - some have suggested it was actually a device introduced by RTÉ radio producers. If it existed before 1950 it was certainly not widespread, although the pianist with the Moate Céilí Band, Billy Donnelly, often introduced their recordings with a few vamped chords. Whatever the case, by the time of All-Ireland Champions - Violin, the practice had become de rigeur, especially among céilí bands, membership of which was common to all four participants. However, for some reason, Daniel Michael Collins has decided to clip these two chord intros from every track where Bridie Lafferty had originally employed them. Now this is a straightforward rewriting of history akin to Stalin’s fondness for amending photographs to eradicate alleged revisionists. As Bridie played in that way it is debasing her memory to suggest that she did not. In this way the Shanachie reissue cannot possibly claim to be “An Historic Recording” but is, in reality, a distorted version of that history and, in the case of Kitty Gone a-Milking, a clumsy one too! Finally, the cover of the liner notes and its centre pages include photographs of the participants, though its a pity that Shanachie’s photo researcher has not delved especially deeply since the photos of the four musicians on the cover are actually extracted from photographs in the centre. It is also disappointing that no attempt has been made to list the members of the Tulla Céilí Band photograph from which the individual shots of Canny, Hayes and O’Loughlin have been drawn nor even dated any of the photographs at all. It would not have involved too much effort to have identified, for instance, Seán Reid (second from right, back row), accordionist Paddy Mac Namara (second right, front row) or the cheeky-faced pianist George Byrt. All are familiar faces. Disappointingly too, the proof-reader was obviously confused by the caption to another photograph, calling Aggie Whyte, who is sometimes spelt as White, ‘Aggie Wyite’! Moving on to the album itself, the new opener Rolling in the Barrel/In the Tap Room/The Earl’s Chair introduces the distinctive sound of Paddy Canny’s fiddle and the equally understated piano playing of Bridie Lafferty. To my ears there has always been a slightly harsh edge to Paddy’s playing and this becomes problematic on the second track, the reels Bunker Hill/The Bush Hill where not only do Canny, Hayes and O’Loughlin seem to be out of tune with each other, but Peadar appears to be slightly behind the melody, while Bridie’s piano wanders off course on The Bush Hill. In fact, to be frank, it sounds blooming terrible, perhaps indicating that not all four members were familiar with the tune. In contrast, Seán Ryan’s Jig which follows (actually two jigs written by Ryan) sounds wonderfully relaxed as Paddy and P.Joe weave their fiddles together to the simplest of piano accompaniments, though that slight discordance emerges in the subsequent duet, Egan’s/Lafferty’s. Track 5 takes us to Kitty Gone a-Milking/Music in the Glen, the previously mentioned only surviving duet between Paddy and Peadar and more’s the pity, since there’s a puckishness to their playing that deserves further airing. The following jig, Doctor O’Neill, has a dated feel, possibly through the quality of the sound recording - Bridie’s piano sounds muffled - but more, I think due to the tempo which, though bouncy, is a little slower than today’s fashion. The liner notes describe this as “the very first jig in O’Neill’s Dance Music of Ireland” which is not the case as it appears as number six, an easy point to check. Next comes The Morning Dew/Reavy’s which fully illustrates the impact of Michael Coleman’s recording of the first tune on the two Clare fiddlers as they clearly replicate some f the Sligo fiddlers ornamentations. The second tune, which its composer, Ed Reavy, called The Hunter’s House, is one of the most recorded in the traditional music catalogue, though the version here was almost certainly the first to appear on vinyl and is in many ways still the definitive reading and played with almost effortless guile. Two reels first recorded by the Aughrim Slopes Céilí Band follow - Grogan’s Favourite/Galway Rambler - and both are played with a substantial lack of elaboration, almost mirroring the originals. In contrast, Canny and Hayes almost go wild on a striking rendition of the jig Trip to Athlone, followed by an equally vivacious Pipe on the Hob. Dunphy’s Hornpipe/Chief O’Neill’s Favourite are the only hornpipes here and the first is probably the worst tune on the entire album. There’s a lackadaisical quality to the playing and the rendition of Chief O’Neill’s Favourite would hardly have been likely to have stimulated dancers into action. (Interestingly, Dunphy’s also appears on Paddy Canny’s Traditional Music from the Legendary East Clare Fiddler album, though played there with far more zest.) In contrast, feet would have been flying to track 11, the jigs Carraroe/Portroe while the closing track, the reels, Lucy Campbell/The Boys of Ballisodare returns us to Coleman-land. In conclusion, it cannot be denied that, over all, this was a groundbreaking record and features some inspired playing, especially the duets between Paddy Canny and P.J. Hayes. The addition of Peadar O’Loughlin is not always so successful, but the reason for that is completely understandable, bearing in mind how long his two seniors had been playing together. More importantly, this album was recorded in a very short space of time and sometimes it shows. Some tunes, especially the hornpipes and Bunker Hill/The Bush Hill sound like first takes and almost certainly were, considering the frugal studio time available. Is it a classic? Well, despite its shortcomings, the answer still has to be affirmative. This was the first time that the ‘lonesome’ sound of the East Clare fiddlers appeared on record and, apart from the Feakle fiddler Vincent Griffin’s 1977 album, it rarely happened again until the emergence of Martin Hayes (albeit with his own stylistic elaborations). Additionally, this is now the only chance to hear one of the great piano accompanists, Bridie Lafferty, whose plain, unadorned style is echoed today by players such as Eugene Kelly and Pete Quinn. This review by Geoff Wallis was originally written for Musical Traditions - www.mustrad.org.uk. Some amendments to that original review have been made in the light of a detailed and often cogent response penned by Barry Taylor (which can also be found on the Musical Traditions website). For more information about Shanachie Records visit www.shanachie.com.